I have spent some time on collecting information for VCAP. I have downloaded the blueprint but it turns out I have too much stuff I need to catch up. so I am thinking why not sharing some of my collection while I’m searching? Here is the first post and please write to me if you have your own way to prepare VCAP. Ok. Today topic is understanding storage identifier in vSphere 4.1. I’m not quit sure whether you have noticed the storage identifier in ESX 3.5 is a mess. It’s different from the name you give it via the SAN and it’s all different on each host. vSphere 4.1 has dramatically changed the chaos with new name and new rules. Let’s take detail look. Please be aware that all ESX 3.x examples and discussion in this post referes to ESX (not ESXi). 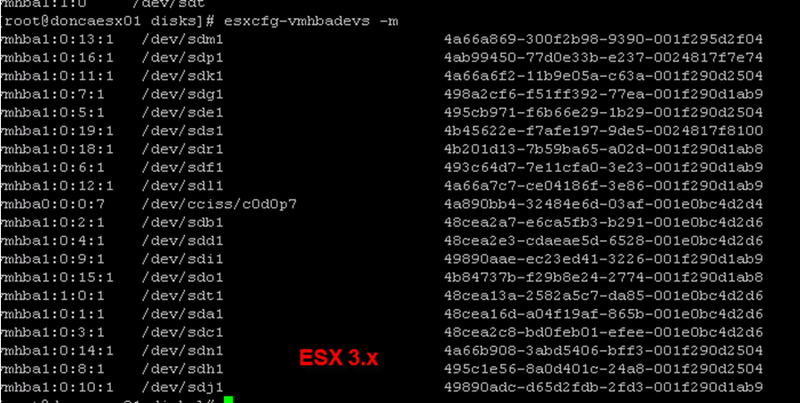 All ESX 4.x refers to ESXi 4.1 only since we won’t use ESX anymore in vSphere 4.1. Also, ESX 3.X will see different storage device (but same type) vs ESX 4.x.Please look the keywords not exactly label. There are 4 different ways ESX use to label storage. There are 6 different ways ESX use to label storage. 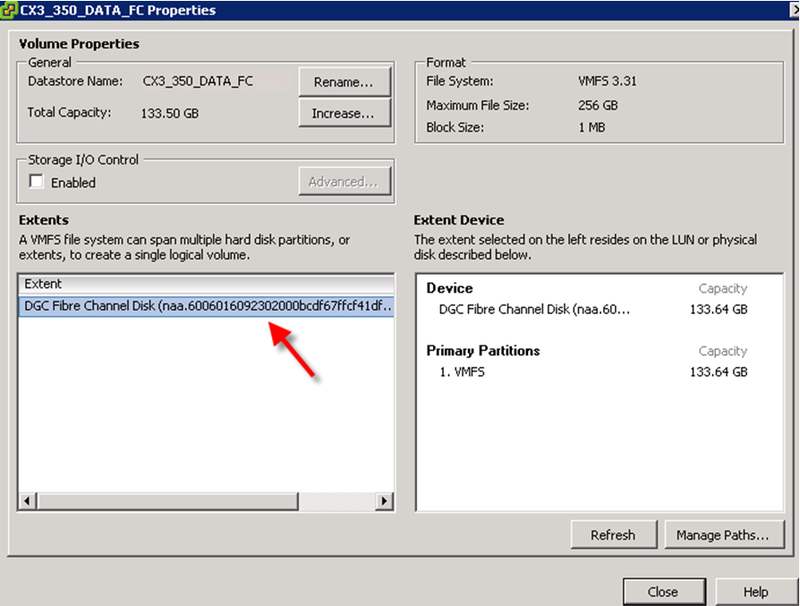 Let’s take a look what ESX 3.x storage properties tell us about device name. Vmware use vmhbax:y:z to identify a storage device. How about ESX 4.x? Here it is. New identifier for ESX 4.x. vmhba was very confused in the ESX 3.X version. It could be considered as path name or device name. In the ESX 4.X, vmhba is exclusively to identify a path to LUN. NAA stands for Network Addressing Authority identifier. EUI stands for Extended Unique Identifier. The number is guaranteed to be unique to that LUN. The NAA or EUI identifier is the preferred method of identifying LUNs and the number is generated by the storage device. Since the NAA or EUI is unique to the LUN, if the LUN is presented the same way across all ESX hosts, the NAA or EUI identifier remains the same. Some devices do not provide the NAA number described above. In these circumstances, an MPX Identifier is generated by ESX to represent the LUN or disk. The identifier takes the form similar to that of the canonical name of previous versions of ESX with the mpx. prefix. This identifier can be used in the exact same way as the NAA Identifier described above but it’s for local disks identity. In other word, this is used for local device only. The VML Identifier can be used interchangeably with the NAA Identifier and the MPX Identifier. Appending:<Partition> works in the same way described above. This identifier is generally used for operations with utilities such as vmkfstools. The vml path hosts the LUN ID, GUID and partition number information and this is also stored in the volumes VMFS header. Vml construct is used by kernel to define paths to see SCSI LUN. This naming convention is not VMware specific. It’s decided by Red Hat Linux and you won’t see that in the ESXi 4.1 since it’s replaced by mpx. This convention is used exclusively by the service console and open source utilities which come with the service console. The <Device Letter> represents the LUN or Disk and is assigned by the service console during boot. 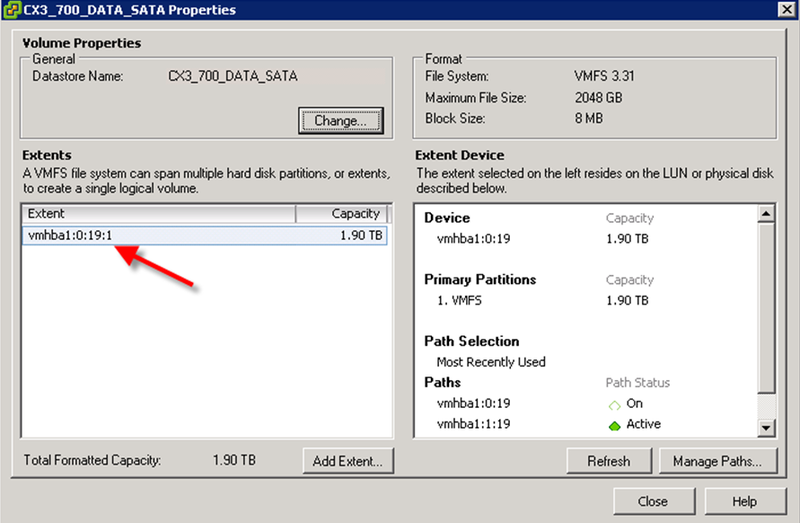 The optional <Partition> represents the partition on the LUN or disk. These naming conventions may vary from ESX host to ESX host, and may change if storage hardware replaced. This identifier is generally used for operations with utilities such as fdisk and dd. 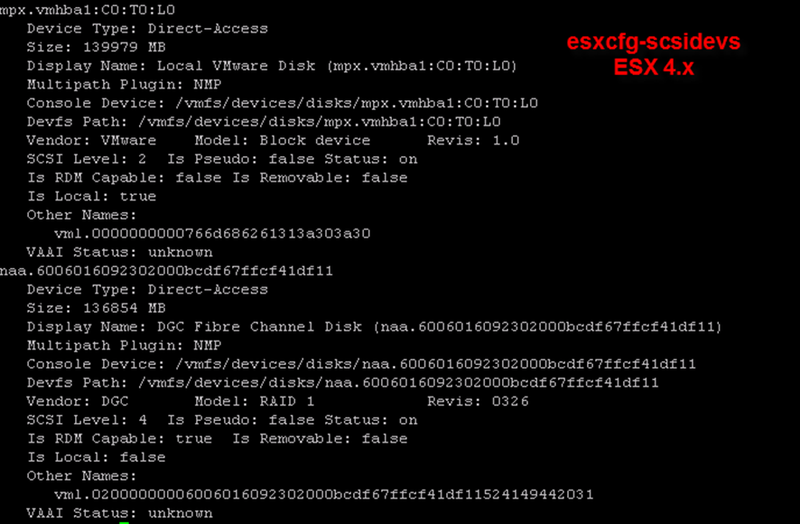 Note: VMware ESXi does not have a service console; disks are refered to by the VML Identifier. The <UUID> is a unique number assigned to a VMFS volume upon the creation of the volume. It may be included in syntax where you need to specify the full path of specific files on a datastore. The UUID is generated on the initial ESX host that created the VMFS volume based on the UUID creation standards. It’s possible to have same UUID although it’s very rare. I’m going to show you a series of command and you will see the difference between ESX 3.x and ESX 4.x.